A: Welcome to another show of VOV24/7’s Food Delight with cooking tips and recipes. B: We’re back today with a super delicious and super easy-to-make recipe for you. It’s one of Japan’s most popular foods: tempura. A: Tempura is a widely known Japanese dish which consists of seafood or vegetables that are battered and deep fried. B: You might be surprised to learn that tempura originated in Portugal. The dish was introduced to the Japanese by Portuguese missionaries in the 16th century. The Japanese adapted the fritter-cooking technique of the Portuguese to create their version of the dish. A: I’ve tried tempura several times. Whenever I visit a Japanese restaurant in fact. But this is the first time I’ve heard of its Western origin. Anyway, the dish is now associated with Japan. B: Tempura is not so complicated to make, but not everyone knows the correct way to make it. That’s why we’ve invited Hoang Manh Thang, a chef from La Grupa restaurant, to join our show today. Hi, Thang. Could you tell us about tempura? How do you make it? Thang: Tempura is similar to wheat flour or tapioca starch but its flavor is special. 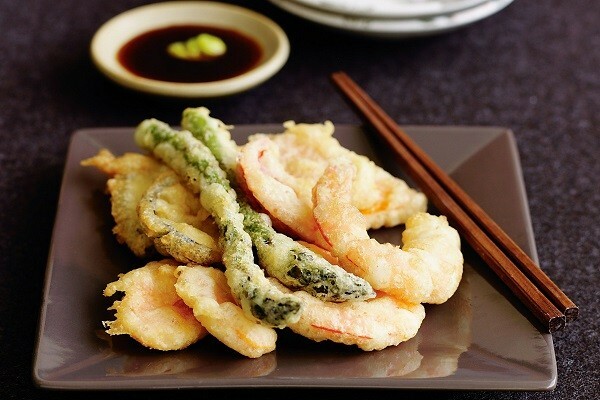 Tempura traditionally is made with prawns, fish, and vegetables. The batter itself is tasty, so you don’t need to add anything to it. A: The most popular ingredients are prawns, squid, sweet potato, pumpkin, and mushrooms. There are several kinds of tempura – vegetable tempura, seafood tempura, egg tempura. The filling may vary, the batter is the same. B: The batter is made with equal parts of tempura flour and water - 1:1 which means 1 cup of water for 1 cup of flour. A: You can add an egg yolk to the mixture if you like. But remember, you shouldn’t stir the mixture too much or it will become thick. The batter should be kept chilled until you use it. When the batter is ready, dip your chosen filling - prawns or vegetables – in the batter, then fry it. B: The tempura is simply deep-fried. But I still wonder how tempura is made at a restaurant. Please tell us, Thang. Thang: Japanese cuisine and cooking techniques are very sophisticated. The main technique for tempura is deep-frying. First, heat up the oil and dip the seafood into the oil. Lower the heat to prevent the food from being burnt. However, to make the prawns more beautiful, we can apply another technique. In this technique, spray oil on the pan. Then, pour a very thin layer of batter. The batter can burn easily, so it’s necessary to lower the heat. Put a prawn on the batter, fry one side and then quickly turn it over to cook the second side. This second technique is more difficult and takes more time, but we often do it this way to keep the prawn in nice shape. A: When the tempura turns a light golden color and becomes crispy, it’s ready to serve. Tempura can be eaten with udon or ramen noodles. The dish is even tastier with chilli sauce, soysauce, or ketchup. B: Tempura is available at any Japanese restaurant, but it is a dish that can easily be made at home. We hope you’ll give it a try. Bye until next time.